“Planty Fierce” are Plantsmen at the Living Edge ..
David Fripp & Blake Jolley have a well kept secrete .. “Living Edge” garden & nursery. Well it never started out being a secrete but horticulturally soaked talent usually burns more like a hot ember. We’ll be blowing the lid off that come Saturday 5th March ’16 when David & Blake’s “Living Edge” garden will open as part of “Planty Fierce”, together with my “Sea-Changer” launch, as a garden extravaganza of four exciting Central Coast gardens you can get to see FREE on the one day. 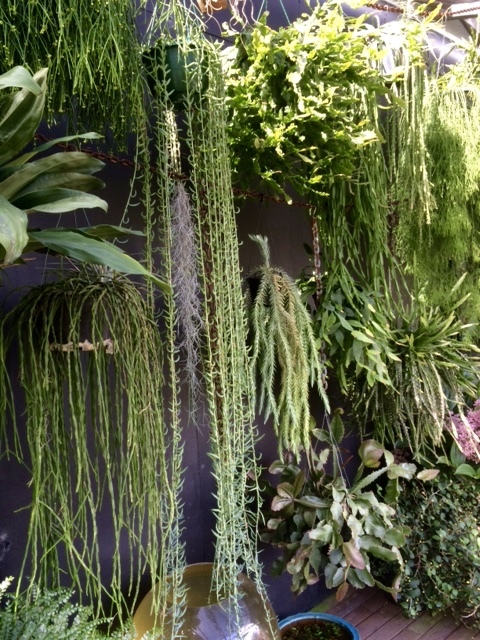 Three of these have never been open to the public before and with “Living Edge” in particular, you can expect a garden made from horticultural treasures at every turn. Stay tuned for details on the other 2 exciting gardens and mark your 2016 planners !! “Living Edge” has a great sense of arrival into an interesting pattern garden that breaks out into beautifully planted pathways and a Dry Garden. Both men have very fine horticultural chops and David in particular as a gifted propagator, so many of the plants that make “Living Edge” from his rather fabulous collection, will be on sale tables for you to take a little (or a lot..) “Planty Fierce” home with you for your own gardens. So bring your questions as both David & Blake will be moving around the garden to help with challenges and share in your successes. And bring your boxes as you WILL be sorely tempted across the sales tables. 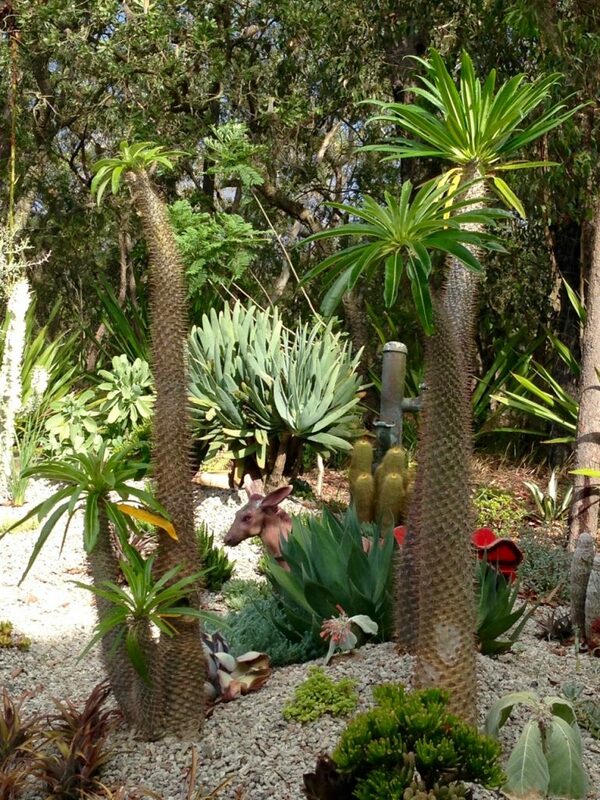 Posted on 15/12/2015 19/01/2016 Categories 9 Comments on “Planty Fierce” are Plantsmen at the Living Edge ..
Quisqualis pseudomussiendifolia ‘Red Riot’Identity crisis ..
That’s what some plants suffer when viewed from a distance. And red, being so conspicuous always catches the eye. 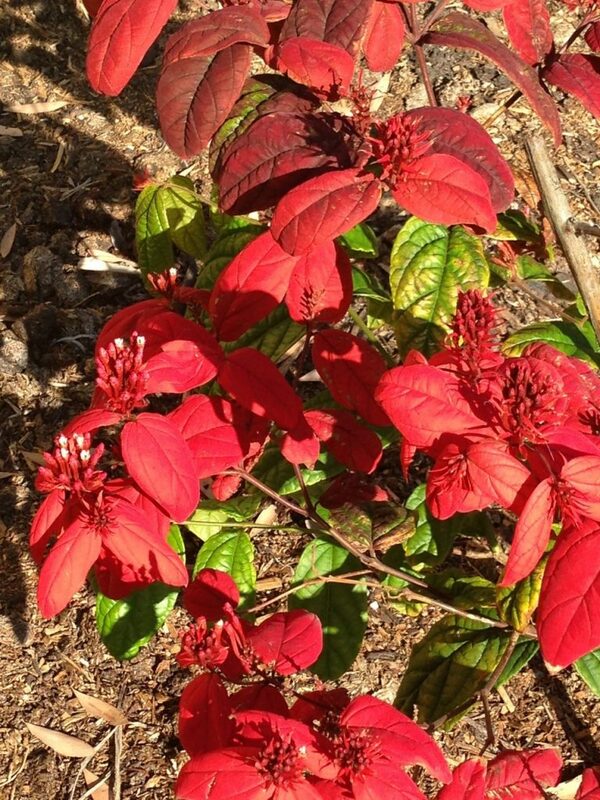 Just another poinsettia ….. in December ? Wait a MINUTE ! A poinsettia with a strangely lax habit and the inflo’s not terminal on branch ends …. THAT is no poinsettia, that is a Quisqualis pseudomussiendifolia ‘Red Riot’ of course it is ..! Now, some you will know Quisqualis from its cousin the Rangoon Creeper but this is less a climber or a shrub and really more a climber/shrub. So useful to lean over fencing for its bower habit. If planted out as part of a mixed shrub combination in a west facing aspect like mine here at “Sea-Changer”, its open habit will probably reach 2 to 3m and the more heat the better. As for the “flowers”, like the poinsettia (Euphorbia pulcherrima) the showy “petals” are really modified leaves. You can see the tiny flower tubes opening white from the centre of each bract cluster. Beautiful seen from above viewed from decks or step out patios and makes a thrilling blaze against the dark glossy greens of viburnum odouritissimum, gardenia, michelia figo, rothmania or posoqueria the Sth American Needle Bush.